Hooray for Mom! You must all be so relieved! Love that she’s helping with the beans! I know you are happy to have your mom with you. Your photos are lovely but the artichoke one is outstanding. Wonderful news that your Mom made it! You all must be thrilled! Fantastic photo of the artichokes! I know there are several varieties but none but one are available here. I know. How we suffer on this side of the Atlantic! 🙂 Thanks for the glimpse into your kitchen. By the way, love your new header photo, too. 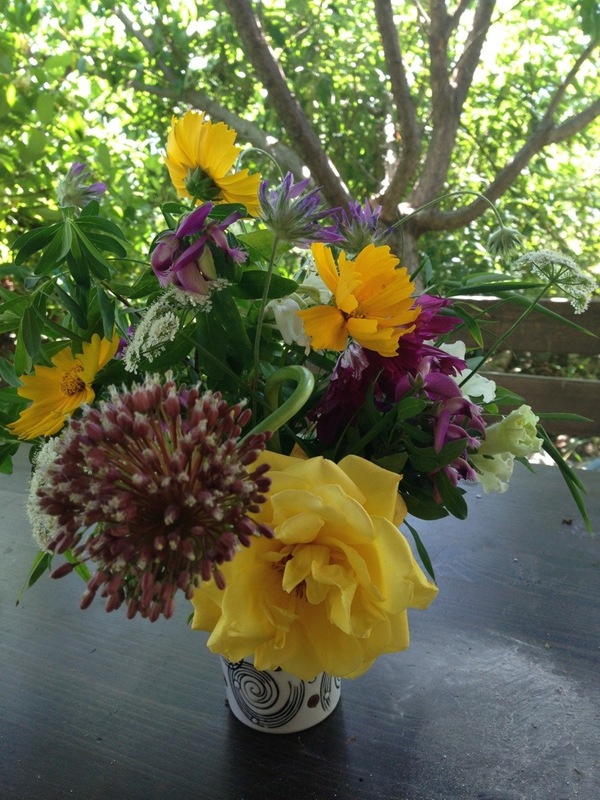 I love that your mother feels free to snip in your garden and fill your house with flowers! So glad she is there with you now! 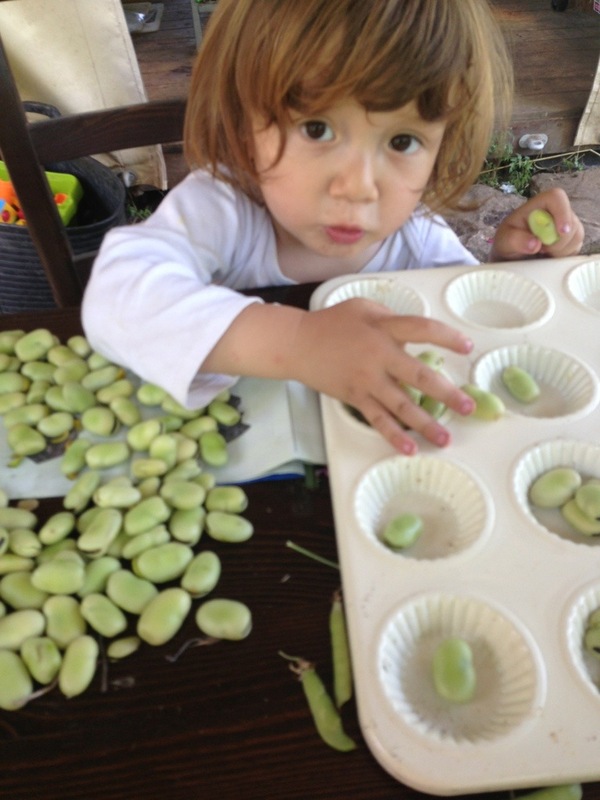 But my favorite picture is of the broad beans being sorted by your adorable daughter. I love that your kitchen is filled with your family! Family members make the kitchen complete! A boiled egg sounds like just the thing – I will have to try that next time. Funny how an egg can round out or completely change a dish – I love leftovers with an egg on top, or an egg over rice is always nice. Beautiful, beautiful, beautiful! Love seeing what is coming from the garden right now! Thank you! It’s a rewarding time of year, to be sure. Thanks very much – I’m sure we’ll get up to all sorts if kitchen adventures together. 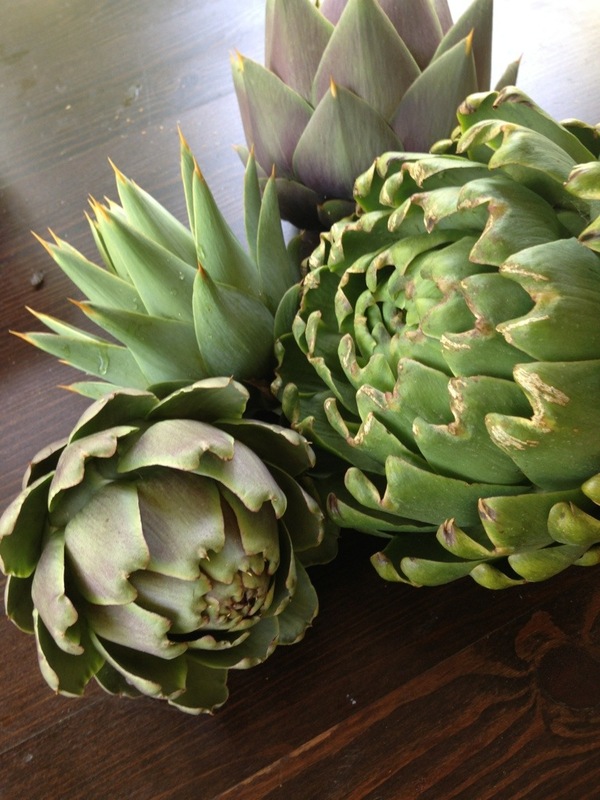 Wonderful artichokes and great to have a peek in your kitchen thanks to Celia. I have flowers in my kitchen too thanks to my Mum and daughter. The ones from the garden are nowhere near as gorgeous as yours though – in fact just realised they are mainly weeds and gone to seed veggies! Actually, I’ve noticed that my mom cuts veg flowers and weeds for her arrangements too. It’s made me appreciate how pretty they are! Thanks for stopping by – it’s always nice to have guests in the kitchen.